The main driver for IPv6 deployment is the IPv4 address space exhaustion, caused primarily by fast growth of residential users. Each residential user needs an IP address, a small company doesn’t need anything more and even a reasonably-sized company can survive with a few IP addresses. One would expect the vendor readiness to follow this pattern, but the situation is just the opposite: while the enterprise networking devices have pretty good IPv6 support (Data Center components from some vendors are a notable exception), the vendors serving the residential market don’t care. 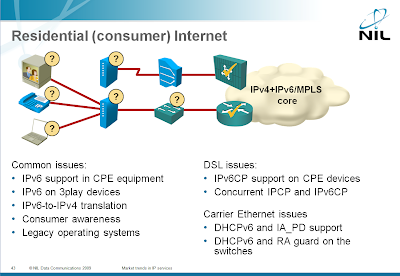 The Service Provider-related IPv6 challenges are covered in my Market trends in Service Provider networks workshop. You can attend a web-based tutorial version or we can organize a dedicated workshop event for your team. It’s amazing how unprepared the residential vendors are: only a few of them offer IPv6-capable DSL CPEs or low-cost routers (make sure you read the whole thread). When faced with the lack of IPv6 feature support, some vendors even have the nerve to hint that you should use a public-domain firmware instead of their own. The situation is no better in the 3play space: try finding a set-top box running IPv6. Oh, and all devices in the path should support wire-speed IPv6 multicast which is needed to deliver the video stream to set-top boxes. Realistically, I’d expect most of the 3play solutions staying within the IPv4 address space for a long time; they’re commonly using private IP addresses, so they are not affected by the IPv4 public address space exhaustion. Just ask Comcast about RFC1918 space exhaustion. This presentation is a little old but interesting none the less. Yeah, I know about Comcast. Their approach is well documented in the "Global IPv6 strategies" book. Thanks for the presentation link: it's always good to get the information straight from the source. Still no customer is ready for ipv6. how to convince them. You don't. They'll adapt or wither.